Penguins captain Sidney Crosby makes his postseason debut Friday night in Game 2 against the NY Islanders at CONSOL Energy Center in the opening round Stanley Cup playoff series. Crosby, who missed Game 1 Wednesday and the last 12 games of the regular season with a broken jaw, met with his doctor Thursday after practice and was cleared to return to game action. “I’m cleared to play tonight,” Crosby said. “I’m excited to get back in there and play in the playoffs. “(The doctor) was around and I wasn’t sure if he would give me the OK or even consider it. I’m happy that he did and happy to be back. ... He's comfortable with me getting hit at this point. That's the biggest thing. He has to be comfortable putting me out there. To hear him say that allows me to be comfortable, too." Crosby, 25, skated with his usual linemates Chris Kunitz and Pascal at Friday’s morning skate. He also worked with the team’s top power-play unit. Crosby said his conditioning is as good as it can be without game action, but there will be some rust to work off after missing a month's worth of games. "It's going to take an adjustment period stepping into the playoffs after missing that much time," Crosby said. "That being said, this is when you want to play. I'm pretty excited." Crosby hasn’t played a game since a Brooks Orpik shot was deflected and the puck struck him in the mouth March 30 against the Islanders. Crosby had surgery and major dental work following the game. Crosby, who lost some weight following the surgery because he couldn’t eat solid foods, resumed skating April 15 with strength and conditioning coach Mike Kadar while wearing a shield around his jaw. Crosby returned to full team practice April 26, a day after having several root canals on his teeth. Crosby finished third (tied) in the NHL scoring race with 56 points (15G-41A) in 36 games this season despite playing in 12 fewer games. From the day he was injured (March 30) it took 25 days until he was past in the scoring race – Tampa Bay’s Martin St. Louis (April 24). 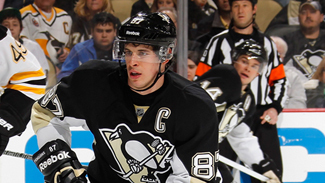 Crosby led the NHL in points per game (1.56) and was named team MVP for the 2012-13 campaign. Crosby was named as the team’s nominee for the Bill Masterton Award – given to the player who best exemplifies the qualities of perseverance, sportsmanship and dedication to hockey – after returning to his high level of play following two injury-plagued seasons with a concussion and neck injury.